← 325 "Milhouse Doesn't Live Here Anymore"
"Smart and Smarter" is the thirteenth episode of season 15. "When Maggie was revealed to have an IQ of 167, Lisa is no longer the genius of the family, causing a rivalry between the sisters." The family, after visiting a pancake house, visits Mrs. Wickerbottom's Pre-Nursery School, where Apu and Manjula are sending two of their octuplets. Homer and Marge have a talk with Dr. Hibbert about getting in, and decide to have Maggie go in. However, Maggie fails the initial screening because she cannot talk, until Lisa discovers some traits of intelligence. Homer and Marge make another screening. The results show that not only is Maggie brilliant, but her IQ of 167 is higher than Lisa's IQ of 159. Lisa is no longer considered "the smart one" of the Simpson family. Her attempts to find a new identity, including a goth named Ravencrow Neversmiles, a cheerleader, a rapper, a soccer player, a cowgirl, and even a stand-up comedian, do not work out well. At home, Lisa teaches Maggie false information. Homer (with the Phonics Frog) and Marge scold her for trying to sabotage her sister's education and that if that is how she really feels, then she should not be her sister's rolemodel. She leaves the house and hides in the Natural History Museum, where there is no chance of Homer and Marge finding her, until Chief Wiggum, Lou and Eddie find her in there. The family goes in the human body, but Maggie accidentally presses the swallow button, swallowing Homer, Marge and Bart. Maggie presses many buttons until she finally presses the evacuate button, following a visual cue from Lisa as to its color. Ironically, after Maggie saves Homer, Marge, and Bart, she no longer has a secret to her intelligence — Henry (the owner of Mrs. Wickerbottoms and parody of Simon Cowell) reveals a video tape of Maggie's audition and it turns out Lisa was subconsciously showing her answers. Henry starts criticizing Maggie which leads an angry Homer to start punching him (while Henry criticizes his punches). Maggie, however, plays Lisa's saxophone in the end, also puts her pacifier into Lisa's mouth. Showing another sign of intelligence, however, a worried Lisa reclaims her saxophone and tells her that it is not for babies. 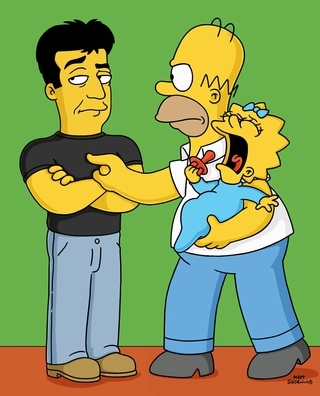 During the credits, Simon Cowell (as himself) criticizes the people who work on The Simpsons. When it comes to 'Special Guest Star: Simon Cowell', he remarks 'Finally, a real celebrity! '.